These blurbs originally appeared in the Good EATS RVA section of RVA #32 Spring 2018. You can check out the issue HERE or pick it up around Richmond now. A former Food Network competitor has returned to Richmond to open a new restaurant in Shockoe Bottom. Malcolm Mitchell, longtime personal chef, restaurateur, and Season 8 finalist on Food Network Star, opened Lower 48 in September in the old Shockoe Valley Pizza space. “It’s basically rustic regional American food, going back to the old school way of cooking… a scratch kitchen,” he said. “I’m just trying to do my interpretation.” Serving dinner and brunch, the chef is whipping up his take on American classics such as shrimp and grits, crab cakes, Texas-style barbecue, burgers, and wings, along with craft beer and cocktails. Competing on Food Network Star wasn’t the chef’s first taste of fame. Mitchell also competed on Beat Bobby Flay. Likewise, Lower 48 isn’t Mitchell’s first dabble in the Richmond restaurant scene. Along with Julep’s owner Amy Ayers, he opened Mint Gastropub in the Fan, which operated for two years before moving, and eventually closing, in Petersburg in 2014. Originally from New York, the chef grew up in Maryland, where he learned the culinary basics from his mother, and from working at local greasy spoons. He left his hometown to spend four years in the Navy, where he didn’t cook, but his passion still flourished. He honed his skills cooking for small parties and friends’ events, but decided he needed to fine tune his craft a bit more before stepping out on his own. Mitchell earned his culinary degree from Stratford University and worked his way up the ranks. “I worked all over the place — chain hotels, little bistros. I worked in school lunch programs with Compass Group, the world’s largest food company. And then I had an opportunity between 2005 and 2007 working for this sports and management company.” Through that gig, he eventually became a personal chef for athletes and musicians like actor/comedian Chris Tucker, singer Mary J. Blige, and the NBA’s Washington Wizards. Mitchell has since opened concepts in Los Angeles, as well as three in Baltimore, including wine bar Butchers Hill Society; Kitchen Market, a specialty foods and grab and go station; and gastropub Ryder’s. Mitchell plans to expand Lower 48 with other locations within Richmond. 423 N. 18th St.
“One dessert to share please” is a strange concept to me. I share most things, but my dessert? Not likely. Yet that’s the motto behind Jess Widener’s forthcoming business, Four Forks. 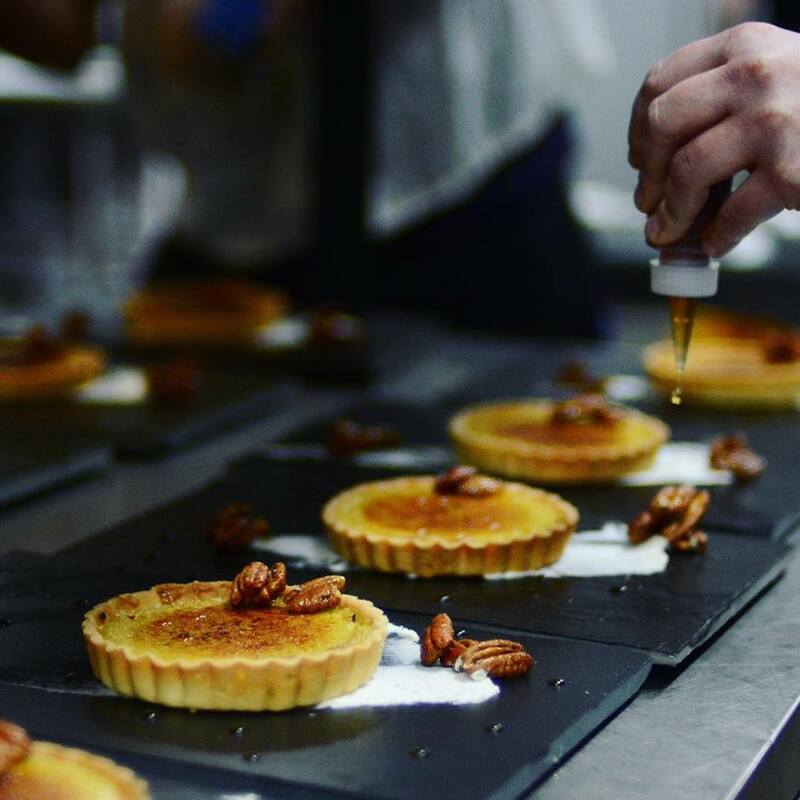 The Lunch/Supper pastry chef serves desserts from the restaurant’s event venue, Urban Roost, and at local farmers’ markets, but is planning to sweeten up Richmond with a spot of her own. The idea is a three-course dessert bar, with special pairings. Widener’s been testing her concept out recently, with pop-ups at The Urban Roost and The Broken Tulip. Before baking at Lunch and Supper, Widener started as a hostess at Brio, working up the corporate ladder to become a sous chef and manager at the restaurant. She also pursued her culinary arts degree at J. Sargeant Reynolds, which she completed in 2013. Widener said she bases her desserts around one key ingredient. Some of her past pop-ups have featured a blood orange and olive oil cake, bourbon crème Brulee tarts, and dark chocolate toffee pudding. The baking gene actually runs in her family. Widener’s dad and uncle were both in the restaurant industry. Her father, from whom she learned to bake growing up, owned Sunday’s before it was The Boathouse, and ran wholesale bakery Ellie’s for years. Widener’s uncle is helping get Four Forks off the ground. Besides monthly pop-ups, Widener will be selling macaroons and bonbons at the spring farmers’ markets, as well as cookies and brownies for the forthcoming Jackson Ward restaurant Salt & Forge, and packaged treats for Richmond Triangle Players. And while there’s no official brick and mortar location yet, she hopes to have her dessert bar open in Carytown by the end of the year. “I love the idea of Carytown, when you have somewhere that features dessert,” she said. “I think you kind of want it to be somewhere that people stumble in after eating dinner.” Widener’s next Four Forks pop-up dinner will be held at Blue Bee Cider April 11. A dilapidated historic building in Jackson Ward will transform into fast-casual sandwich and breakfast spot Salt & Forge in March. Restoring the North 2nd Street property is former Chipotle executive David Hahn, who has plans for a quick neighborhood spot where busy professionals and area residents can pop in to grab a breakfast biscuit or salad and sandwich for lunch. Hahn, a Colorado native, has been on the corporate side of the industry for 15 years. He’s worked for Chipotle in operations and development, and helped DC restaurateurs expand the Philly-style hoagie chain Taylor Gourmet from four to nine locations. He first thought of his River City restaurant after a trip here from Florida, where he was helping launch a startup. “I visited Richmond for the UCI World Championship Bike Race,” he said. “While I was here, I heard a lot of great things about Richmond’s restaurant scene and started asking for restaurant recommendations.” Hahn soon met Melissa, his future fiancé, and once his contract in Florida was up in early 2016, he moved to Richmond to pursue his dream. Salt & Forge will be a from-scratch kitchen with most ingredients made in-house. “We’ll roast our own meat, grind our own corned beef, make our own pickles, jams, dressings, sauces,” Hahn said. The menu offers Ruebens, grilled cheeses, Cubanos, as well as brisket and an Italian sandwich for lunch, and on the lighter side, a beet salad; Mediterranean salad; and a superfood salad with kale, cabbage, bok choy and pickled apples; along with potato salad, fruit, and soups as sides. In addition to lunch, the 42-seat restaurant will be open for breakfast, serving biscuits and gravy, chicken biscuits, egg sandwiches, and biscuits with jam, along with cold-brew coffee. Locally-sourced desserts, beer, and wine will also be on the menu at the restaurant. Hahn plans to offer delivery as well as catering to local companies when he’s up and running. Salt & Forge is still undergoing construction, but Hahn plans to be open by mid to late March. 312 N. 2nd St.
Editor’s Note: Since the version of this story ran in print, Salt & Forge has opened in Jackson Ward.